Gorgeous card. That paper is stunning. I love the colours and all the patterns on your card Linda. It is gorgeous. Oh Linda, I love how you colored the butterfly, beautiful creation! Oh, this is just gorgeous and I LOVE that butterfly. So glad you joined the Stampin B's die cut challenge this week. Linda, What a pretty card! Love how you colored my butterfly image too, Thanks for joining us this week at Pattie’s Creations Design Challenge. This is gorgeous. I love the butterfly. Thanks for joining us at Pattie's Creations. 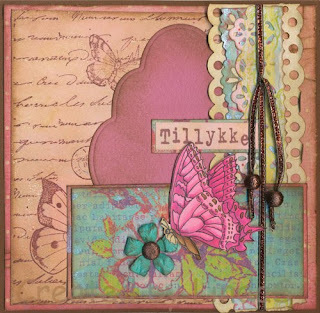 Thanks for joining in our Pattie's Creations Design Challenge with that really BEAUTIFUL card - I love that you used a Pattie's image - each and every element of your card is stunning!, making this an awesome card! Well done! Hvor er dit kort smukt. Mange skønne detaljer. Super lækkert at se et vintage kort med fARVER på! Det er super lækkert.Tusind tak fordi du deltager i vores konkurrence på Panduro Hobby´s scrapbooking blog. Hei! Dette var virkelig nydelig Linda! Elsker fargene dine :-) Nydelig komponert. Very pretty! I love all the layers and colors.